Sarah traces a WWII biological warfare project to an idyllic island in the Indian Ocean. Shortly after she arrives, another former Planet Three reporter joins forces with her, investigating the same suspicious bio-engineering project. As reluctant as Sarah is to involve her friends, she quickly becomes Wendy’s sidekick, trying to keep up with her and stay ahead of the latest sinister figure tailing Sarah wherever she goes. The climax is brilliant: Sarah’s in mortal danger, millions of lives are threatened, and at long last she learns who’s been making her life hell for months. Jeremy James/Jez Fielder has a crowning moment of awesome as Josh, not so much for his heroism as for his poignant brain-freeze after the fact. Even more than in previous installments of the series, this story feels like a game of Battleship. Sarah is trying to close in on her enemies while staying out of their clutches, and the threats to life, property and friends are frighteningly close on her heels. Yet Natalie thinks Sarah’s being paranoid! I can’t say much more without spoiling key twists (see below, after the break), but this is a well-paced story that held my interest from start to finish. The nefarious plot in this story is one of the most high-stakes so far: millions of lives are in danger, perhaps even more than during Test of Nerve. Nevertheless, I was more indignant at the dastardly theft and misuse of K-9. Not named, mind you, but the folks from AudioVisuals are old hands at dodging copyright. Minor quibble: the plan to frame Sarah for a horrific biological attack seems awfully far-fetched. She’s not a scientist; she’d have to have an advanced science laboratory, hundreds of thousands of dollars worth of equipment, and workers/scientists to carry out the job. Wouldn’t the finger of suspicion point straight back towards the scientific lab near the scene of the crime? 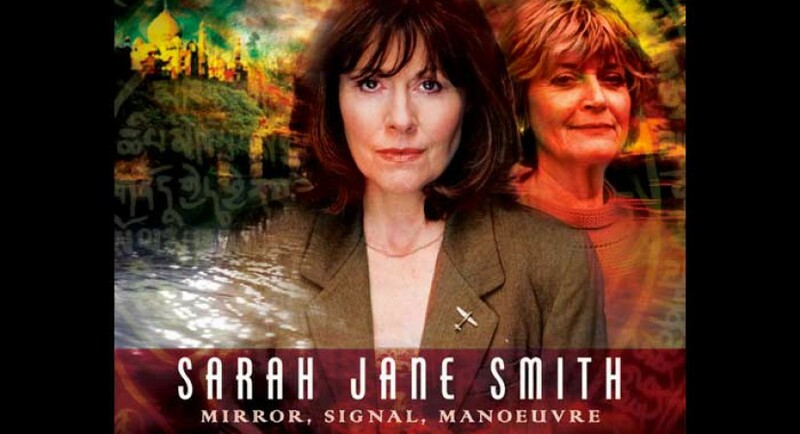 Also, if Ms Winters isn’t simply trying to ruin Sarah Jane (which she insists is a side project), then what’s the motivation for poisoning millions of Indians? Sarah tries to pass over this sticky point by muttering something about blackmail, but it sounds a bit forced. Ditto the mass poisoning in London, or the genetic engineering project in Comeback for that matter. Possibly these are all supposed to be bioweapons development, but it seems like large-scale tests like this would draw unwanted attention towards Winters & co.
On the other hand, it’s no more harebrained than Winters’ original plot way back in Robot, is it? I can’t remember; I haven’t seen that serial since the 80s. It may be high time for me to watch it again. I don’t remember him, but I appreciate that Winters’ assistant Jellicoe from that story turns out to be the father of Wendy in this one. Nice continutiy nod.